Spring is in full force here. Suddenly all of the trees have leaves and things are blooming. I was afraid my lilac bush wouldn’t bloom this spring since it started to bloom and then froze back in the fall. It is gorgeous this year though. There were enough blooms that I didn’t mind whacking off a few to bring inside. If you remember those video games from the 80s, you might appreciate this video of 8-bit monsters taking over New York. I spotted teeny tiny book necklaces at Black Spot Books on Etsy. Apparently these are real books. I check out Molly the barn owl and her owlets from time to time, so I got a kick out of this video of barn owlets "singing" Bohemian Rhapsody. 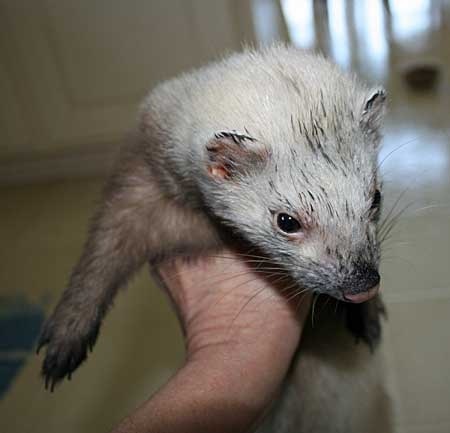 On the other hand, the ferrets here have been up to nothing good since spring hit. They’ve been wild. The week started with strange noises coming from kitchen. When I go to check it out, I find a kitchen sink that looks like this. Yes, that’s lots of little black ferret footprints, with more footprints all over the counter. I’m still not sure where all of the black came from. The big question was how did a ferret get up there. I have an old cupboard near the counters. Apparently Clyde unlatched the door of the cupboard. Jumped from the cupboard door to the kitchen stools, to the counter. The first book on ferrets I bought stated "Ferrets are not known for their climbing ability." Well maybe not the author’s ferrets, but my ferrets can climb just fine. Those wee books are adorable!! Hmm. 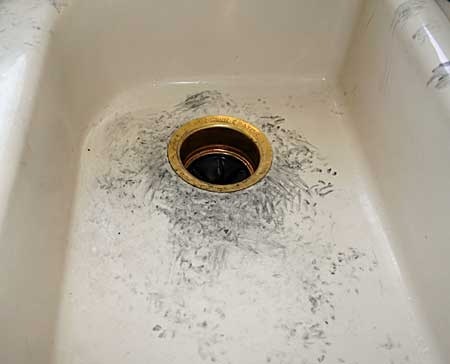 Someone had his head WAY down into the garbage disposal – that looks like sink/pipe gunk. I just love those ferrets! They are SOOOOO cute! They don’t mean to be so naughty! 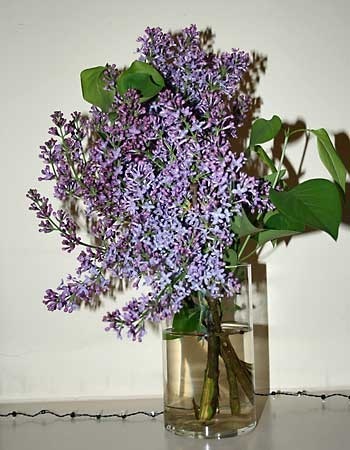 Love the lilacs — I can almost smell them from here. Oh that funny Clyde. I love his face in that picture, looks like he’s saying, what I didn’t do anything.